OhGizmo! Review – Kobo eReader Touch Edition | OhGizmo! 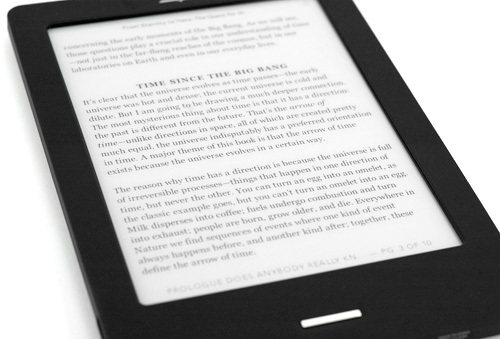 While reports of the death of eReaders, at least those that rely on e-ink display technology, have been greatly exaggerated. There was a time when it seemed like more capable tablets, such as Apple’s iPad, would be their demise. Their large, color LCD displays made viewing publications like magazines and newspapers far more enjoyable than on black and white e-ink displays. And the ability to instantly zoom, pan and flip pages with a simple touch made using a control pad, or physical buttons, seem downright antiquated. In fact I’ve made mention of it in the latest technology reviews, but every time I introduce someone to an eReader their first instinct is to touch, tap and prod the screen to get it to do something. And I always have to redirect them to a button and explain that the electronic ink technology used makes it very difficult to integrate touch sensing functionality. But all that has now changed. 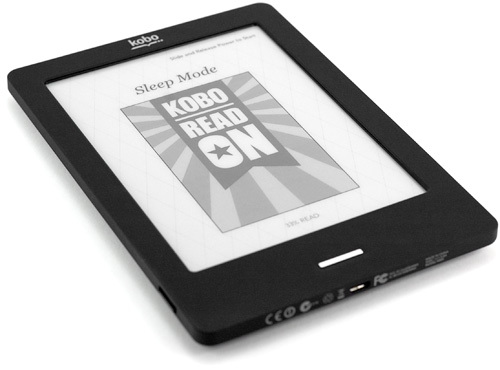 Thanks to Neonode’s zForce technology, eReader’s like Kobo’s new Touch Edition have finally gained touch screen functionality. Without affecting the contrast or legibility of their displays. And let’s face it. We’ve all had plenty of quality time with Apple’s iPad by now, and have discovered that even the 2nd generation of its hardware is not exactly the lightest and most ideal solution for reading ebooks. Nor are any of its competitors. So as a result, eReaders have been making a well-deserved comeback I feel. And we recently had the chance to try out the aforementioned latest and greatest offering from Kobo, their new Touch Edition, and walked away extremely happy with how far the technology, and eReaders in general, have come. More after the jump. The original Kobo eReader hit the market over a year ago and shook up the ebook reader market with a $149 price tag. It was admittedly not as full-featured as Amazon’s Kindle and even Sony’s offerings, but it was simple, had a polished UI and just plain worked as most users would need. So much so that it eventually forced the other companies selling eReaders to lower their prices, or create simpler versions that could compete price-wise with the Kobo. It was a great example of why competition is a good thing. And thankfully the company hasn’t rested on their success. Instead, they followed up the original Kobo eReader with a wireless wifi equipped version, and now the Touch Edition which finally brings the ability to not only touch the screen to navigate the UI, but also a smaller and more convenient form factor thanks to a minimal need for buttons. …and only just a touch wider as you can see above. Of course that’s mostly because of the plastic border around the display giving you something to hold onto. Otherwise holding directly onto the edge of the display would cause the pages to flip all the time. And of course it goes without saying that the Kobo Touch Edition is far thinner than your average novel. But that’s been the case since day one. In fact it’s getting down to the size of the iPhone 4 as you can see here, making it relatively pocket-friendly. It’s still not going to squeeze into your jean’s pockets like the iPhone can, but to be honest I’m not sure if I’d want an eReader with a display that small. The Kobo Touch comes pretty close to the page size of a standard novel, which means you can fit a good amount of text on screen without requiring a page turn every few seconds. 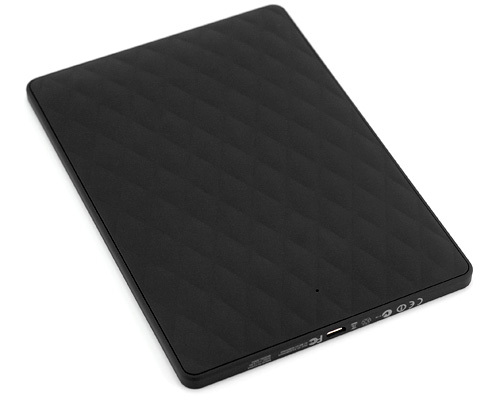 And if you’re curious, the back of the Kobo Touch still has that rubberized quilted texture of the previous generation Kobos, which provides a bit of extra grip when held in one hand. I do find it to be a bit of a grease magnet, with fingerprints really standing out against its black matte finish. But it still feels good in hand. And if black isn’t your favorite color the Kobo Touch Edition also comes in silver, white, blue and lilac finishes on the back, which are probably less prone to showing fingerprints. 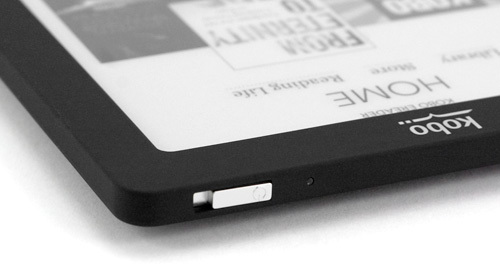 Along the top edge of the Kobo Touch you’ll find a sliding power switch which has multiple functionality. When you slide it across and quickly let go it will put the Touch into sleep mode, or wake it from it. But if you slide it across and hold it for slightly longer, it will power down/power up the Kobo. And to the right of the power button (as pictured in this photo) there’s a small LED which glows when the eReader is being charged. 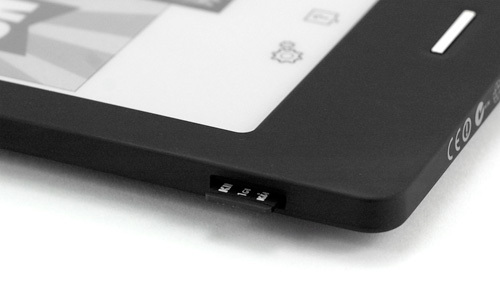 On the bottom of the Kobo Touch you’ll find a microUSB port which is used for charging the device, but also syncing to your PC and the desktop application, if you don’t want to use wifi all the time which can be a drain on your battery. 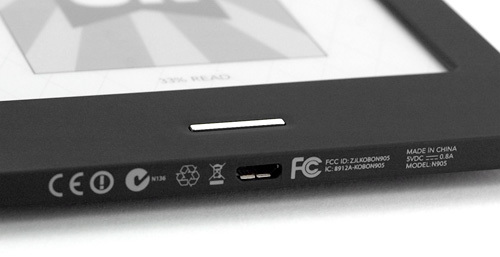 And just above the microUSB port you’ll find the Kobo Touch’s only other button. Like the iPhone and other iDevices, the Touch has a single home button, just below the display, which will return you to its home screen no matter where you happen to be. I’m sure some touch purists don’t think it’s necessary, but I like being able to jump to the home screen with just a single press. The button also sits pretty flush to the surface of the Kobo, so while it’s hard to accidentally bump against and accidentally press, I also find I need to use the tip of my finger to activate it. But that’s a minor complaint. And while the Kobo comes equipped with 2GB of built-in storage, which in terms of ebooks should last you years and years, it also has a microSD card slot allowing you to expand its storage capacity by up to 32GB. I also find it’s the easiest way to get content from other ebook sources onto the Touch, since it’s hot swappable. Every time you insert a microSD card it rescans it for new content which will then automatically show up in your library if it’s supported. 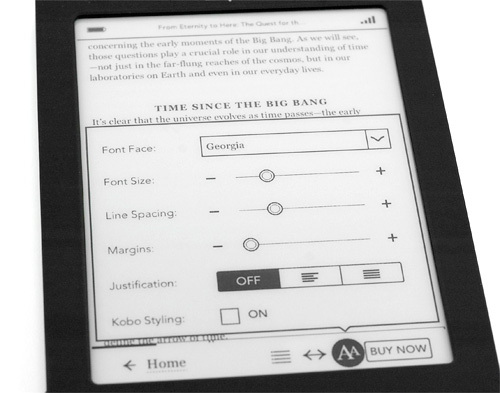 As for screen quality, the Kobo Touch uses the latest generation Pearl e-ink displays supporting 16 levels of grayscale. In the past the Kobos have always been one generation behind the displays used by Amazon in their Kindle, but they’ve now caught up. So that advantage among the competing eReaders has been rendered moot. And compared to previous generation Kobos the Touch Edition’s display is particularly bright and crisp, and has the fastest refresh to date. I also like that the Kobo Touch lets you specify how often the display gets an entire refresh. By default it’s set to every 6th page turn, which means that in-between only certain areas of the screen are refreshed as needed. On one hand it reduces the number of times the display has to flash to black and back for a complete refresh, extending the battery life. But on the other hand the image and text quality slightly degrades each time, until it completely refreshes. I now have it set to refresh more often because I’m picky, but the default setting should be more than adequate for most users. 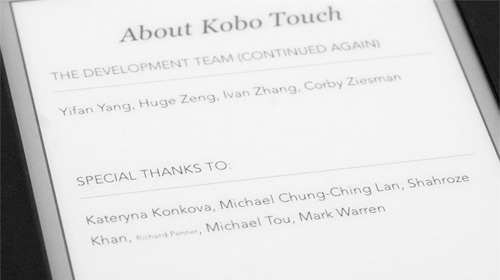 I also have to make mention of how the ‘touch’ part of the Kobo Touch Edition’s display works. If you’ve been following the evolution of eReaders over the years you’ll remember that Sony was the first to release an e-ink device with a touchscreen display. With much backlash from their users. Like the iPad, it used a glass panel over the e-ink display which worked great for the touch aspects, but had the unfortunate downside of creating a lot of glare. Which made reading on its non-backlit display almost impossible. So instead of placing something over the e-ink display, the Kobo Touch has infrared sensors surrounding the perimeter of the display, which as a result is slightly sunken. From our testing it’s very accurate and very fast, and it can work with even the lightest touch since it’s really just detecting the position of your fingers. Because the display is sunken you do occasionally end up with a bit of shadow around the inside edge, but it’s dependent on the lighting conditions you’re in, and far from a deal breaker. 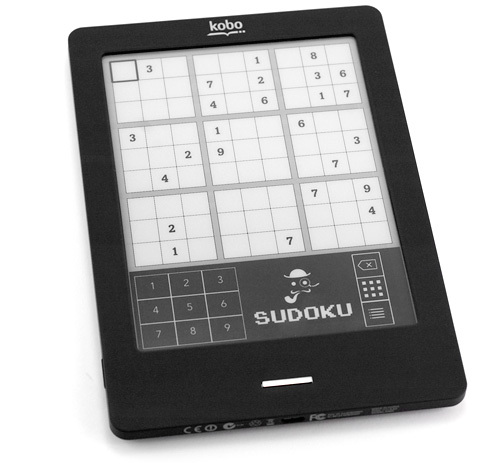 The Kobo Touch also brings with it a faster 800MHz Freescale processor and the latest generation of Kobo’s eReader UI. Including an extensive array of font and text layout options. I particularly like being able to reduce the line spacing, as well as the margins to fit as much text onto a single page as I can. Best of all, in addition to the 7 different fonts you have to choose from with the latest version of the Kobo software, you can now upload your own font if there’s something you specifically would like to use. Of course if page refreshes bring you as much a thrill as erasing your Magnadoodle did back when you were a kid, you can boost the Kobo’s font size to ridiculous levels, requiring a page turn every sentence or so. There are other advantages to a touch screen display besides ease of use however. 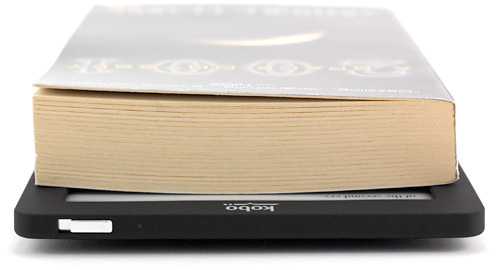 Tapping either side of the Kobo Touch’s display causes the page to flip forward or back, while tapping in the middle brings up the navigation and customization menus. But if you touch and hold on the display, you’re able to make text selections of individual words or sentences. These can be saved if there’s a particular quote you’d like to remember, or in the case of single words, bring up a definition courtesy of the Touch’s built-in Merriam-Webster dictionary. And last but certainly not least when it comes to the advantages of a touch screen display is the new Kobo’s virtual on-screen keyboard. Unlike the Kindle, the Kobo never opted for a full QWERTY keyboard below the display, which made doing searches, entering wifi codes and making purchases directly on the device a bit difficult to put it mildly. But at the same time, a hardware keyboard, even a compact one, adds size and weight to a device that strives to compete with a lightweight paperback novel. Accessing the Kobo online store on the Touch, which is made far more accessible thanks to its touchscreen display, is certainly usable. But I tend to find myself using the desktop application more often than not. While the Kobo connects to my secure wifi network without any problems, there are random times when it disconnects and I usually have to just stop and wait for it to re-establish agreeable relations with my router. So searching page after page for something interesting to read can be frustrating when you suddenly lose wifi access. Buying books is relatively painless and quick though. However, I think it would be fantastic if the storefront on the Kobo indicated which books I had already downloaded or purchased. As it is there’s no indication that something has been downloaded, except directly after you’ve made a purchase when the ‘Download’ button gets inverted. But as soon as you navigate away from that page it gets reset. Basically I’d like it to operate more like the iTunes App Store does, indicating when an app has already been installed. But overall the on-eReader storefront does a good job at highlighting new content, or popular books, newspapers and periodicals that might interest you. Off the main page it provides lists of the NY Times bestsellers for fiction and non-fiction titles, as well as lists from other publications like the Globe and Mail. And of course being able to just search for your favorite author using the on-screen keyboard is dead easy. 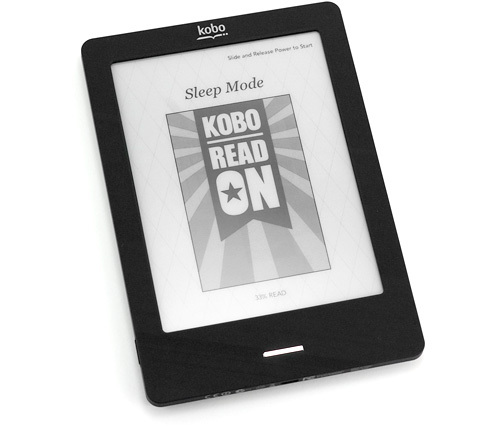 You’re not limited to only getting content from the Kobo online book store though. 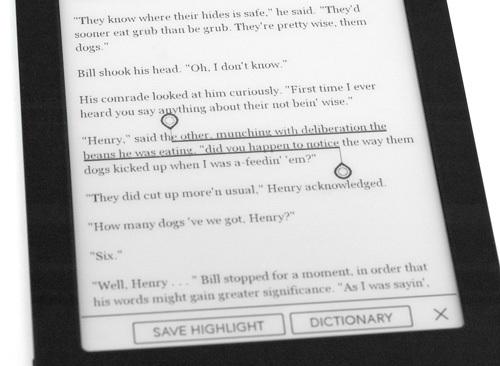 The Touch supports ePub files, PDFs, TXT files and even images from any source. So downloading content from other online stores is not a problem. And if it’s only available in a format that the Kobo’s not happy with, you can just download and use Calibre to perform any format conversions you need. Since their launch Kobo has always boasted about their eReader’s ability to natively read PDF files. 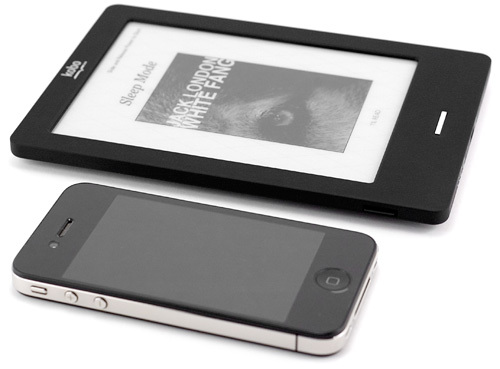 But to be perfectly honest, I just don’t think e-ink based readers are the best portable devices for accessing PDFs. The load times are relatively slow, at least when compared to accessing them on a tablet like the iPad, and their limited processors make resizing, zooming and panning a PDF less than snappy. The touchscreen capabilities of the new Kobo does make loading and navigating PDFs a little easier, but I’m afraid I would simply never rely on it for that purpose. I was also pleasantly surprised to discover that the Kobo Touch Edition can read CBR or Comic Book Archive files. Loading up the Watchmen comic required minimal fuss and muss which was nice, but like PDFs, I just don’t think the current crop of e-ink based eReaders are ideal for these types of files. When viewed to fit the screen the text is so small it’s barely legible, and having to constantly pan around to read from panel to panel when zoomed out is no where near as smooth as it is with the iPad, given the way the screen refreshes. 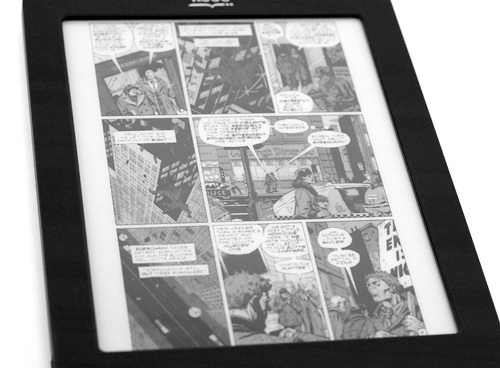 So while it’s nice to have, and may work perfectly on some comics with simpler layouts, for the most part I wouldn’t dub the Kobo Touch Edition a great comic book reader either. 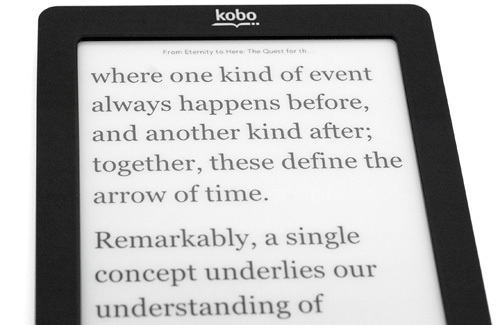 There are other surprises in the Kobo’s UI which could one day make it more than just a simple eReader type device. But that day certainly isn’t here yet. Digging through the various settings I came across a link to the Kobo’s rudimentary built-in web browser, which has been obviously buried because it certainly isn’t ready for primetime just yet. Loading pages and browsing the web certainly works, but it’s somewhat hindered by the Touch’s limited processor, and again, the way the display constantly has to refresh. Just setting up OhGizmo! in the browser to take that photo was a little more involved than it should have been. So while someday browsing the web might be passable on an e-ink device like the Kobo Touch, it isn’t right now. It’s not a formatting error though. Tapping on Richard Penner’s name will bring up a secret Sudoku game that has 4 levels of difficulty, as well as the ability to put ‘temporary’ numbers in each space as you work through solving the grid. I can understand why it’s not exactly a selling feature and why the company makes no mention of it in their PR for the Touch, but I think a lot of users would be happy to see it moved to a more accessible place in future software updates, because it’s actually quite playable. I’ve been following the evolution of e-ink based eReaders since Sony’s first offerings many, many years ago. 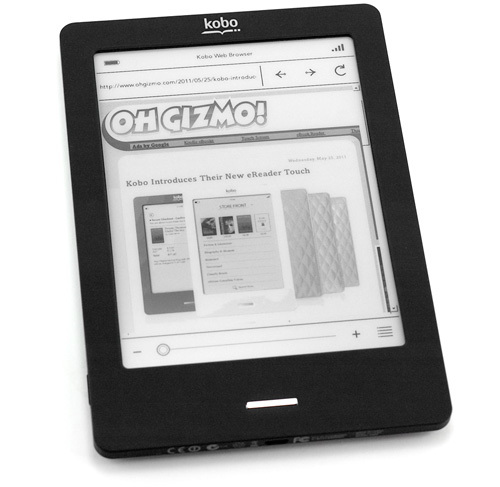 And to be perfectly honest, the Kobo Touch Edition is the first eReader I would actually consider buying. I’ve had the opportunity to play with countless models over the years, and there’s always been limitations that have discouraged me from picking one up. One of the biggest of course has been the often obfuscated way the user has to navigate their UIs using limited hardware buttons. The Kindle’s addition of a full keyboard was certainly a step in the right direction. 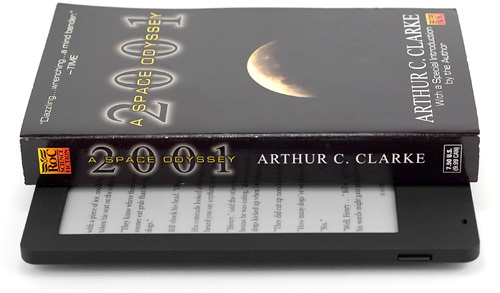 But it had its own issues, adding a lot of size to a device that needed to keep shrinking to compete with real books. So when the Kobo Touch Edition was announced back in May, I was extremely excited that not only had e-ink devices finally gained touchscreen functionality, but that it came at nearly no cost to their usability. In fact, it vastly improved their form factor by getting rid of the need for hardware buttons. The best part though is that the new Kobo Touch didn’t come with an inflated price tag ‘justified’ by the new functionality. Like the original Kobo it’s still incredibly competitively priced at $129.99 ($139 CDN) making the decision between it and Amazon’s Kindle, arguably its biggest competitor, more difficult than ever. It’s still lacking the always-on 3G connection of the Kindle (only available in their more expensive model mind you) as well as the backing of the gigantic Amazon ebook store. And the wifi connectivity issues can be a little annoying at times. But in a surprisingly short amount of time the team behind the Kobo has managed to create and position their device as one of the leading competitors in what was once a very crowded market. And if form factor is one of your highest priorities when it comes to choosing an eReader, we certainly feel that the Kobo Touch Edition is one of the best options on the market right now, and certainly worthy of your consideration. 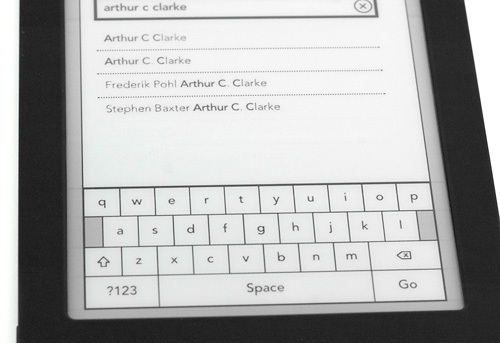 + Finally adds touch functionality to e-ink based eReaders without sacrificing the quality of the display. And the touch functionality is accurate and snappy. + Smallest Kobo ever, whilst incorporating a top-of-the-line e-ink display and other new technologies. + Lack of always-on 3G means a robust battery life. + Wifi connection lets you go wireless when available, letting you buy books on the Kobo and easily sync bookmarks with other devices. – A touchscreen display also means the screen will get covered in fingerprints. – Wifi connection was a little wonky and tended to drop out fairly frequently. 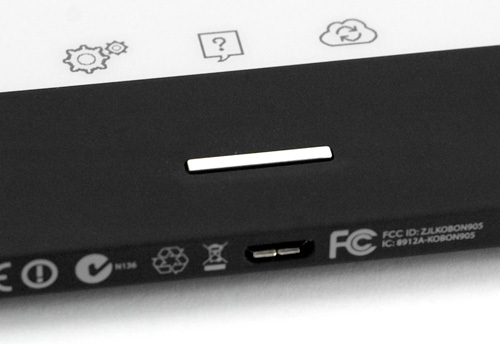 – While small and compact, it’s not always the easiest device to hold in one hand. – Flush mounted and thin home button is occasionally hard to press. – PDF and CBR support works, but the Kobo Touch Edition is far from an ideal reader for those file formats. If you have any questions about the Kobo eReader Touch Edition you’d like answered, please feel free to leave them in the comments, and I’ll try to respond to them as best I can. Have you tried using the Nook Touch? It’s been out for a while, and my (admittedly limited) research shows it has more options with similar usability. Of course both do certain things better, I’m just curious, I didn’t find a nook review on this site. 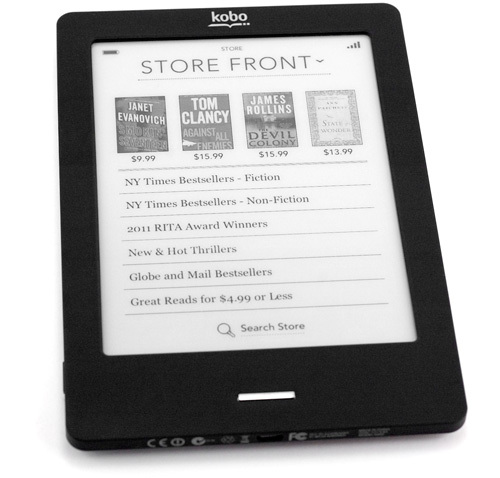 If I’m in Canada and I order the Kobo from the US, does that cause any issues in terms of usability? With the US lower price and the strong Canadian $, there’s a significant saving, but I know there are some issues with other ereaders if you do this. I still like my Cruz Velocity ereader. I need color and it has touch. I use a stylus so there is no finger prints. I hook into my wi fi just fine. I have a 32 gig SD card for storing my data. It has a 4 gig memory and 4 gig built in sd card. I found an app to help extend the battery life and an app for antivirus support. Still looking for a an app for my husband that is TTS. He went blind in one eye in Jan 2010. Oh, I’m finding the touch KOBO slow…but maybe that’s because I’m a faster than average reader. I’ve already maximized the number of words on the screen but I’m still frustrated with the loading factor. I know this comes late, but it shouldn’t cause problems… However, the low price may mean that it comes with offers, which means that there will be the occasional ad that pops up on your screen! I really like my Touch! It is perfect for me. I just bought it about two weeks ago and I am really excited that I get the 2012 book of the month membership! And it was free! I really like the screen because it looks exactly like a page in a book, and the reader itself is super light so I can read for hours without my arms getting tired… Sounds funny, but it is true!! !